Aim/Background: The study describes the assessment of a prosocial intervention in a residential setting for juveniles with sexual offenses, using a variant of Aggression Replacement Training (ART), seeking to replicate the results of a previous study. Material/Methods: The current study used a 30-session ART type intervention with 14 youth using a pre-post-test design. Changes in psychological factors were assessed rather than long-term recidivism. The study also examined factors contributing to therapeutic change and whether these are consistent with theories regarding why ART interventions are effective. Multiple assessment methods with multiple informants were used, including standardized measures, and also a qualitative focus group using study subjects to compare against quantitative results. Results: The study supported the hypothesis that ART was significant in promoting therapeutic change in subjects across all instruments used in the study, and consistent with current theories regarding ART and changes in prosocial reasoning skills. The qualitative focus group results were consistent with the positive quantitative results of the study. The study also replicated results from the previous research which used the same intervention and used some of the same outcome measures. Conclusions: The ART model used was cost effective, easy to implement, and had good patient satisfaction. Developing and validating practical, cost effective, and replicable methods for effective treatment of juveniles who sexually offend (JSO) is an important goal for this area of practice. As Ralph and Wong (2012) note, the first JSO programs were created using the best judgment of practitioners, but virtually no research. Regarding these early developments, Knoff, Freeman-Longo, and Lane (1997) note, "because there were no scientifically based theories or model programs to guide their development, most of the early programs developed their understanding of sexually abusive youth and designed treatment approaches through trial and error" (p. 186). This goal of developing evidence-based practice, is a major positive development in the field for which some evidence exists. Reitzel and Carbonnel (2006) reported a meta-analysis of nine JSO programs with a total sample size of 2,968 mainly male youth. Their meta-analysis focused on the effectiveness of JSO treatment regarding reducing sexual recidivism with an effect size of 0.43, which was statistically significant. Comparing those who received treatment with those receiving no treatment, the sexual recidivism rates were 7.37% versus 18.93% for the treatment and no treatment groups, respectively. Every study included had a positive effect size superior to control groups, meaning there was support for the treatment program as an important variable in lowered recidivism rates. Program type was not related to program effectiveness, but other factors including participant characteristics were. Well researched models such as cognitive-behavioral programs or Multisystemic Therapy (MST) showed effectiveness, but other models did as well. Research with MST (Borduin, Schaffer,h & Heiblum, 2009), using a randomized design, looked at recidivism rates for 48 high risk JSOs using an 8.9 year follow-up, and concluded the effectiveness of MST over other "usual" methods of treatment. Borduin et al. (2009) found that the MST treatment group had an 8% sexual recidivism rate versus 46% for the standard treatment group, and nonsexual recidivism rates were 29% versus 58%, respectively. Standard treatment was a cognitive-behavioral model, not using a manualized approach and without fidelity monitoring. Social skills training, avoiding delinquent peers, improving school performance and involvement, were part of the MST model, but techniques to promote this were not manualized. Worling, Litteljohn, and Bookalam (2010) reported a match case/control study using a 20-year follow-up from the SAFE-T program in Toronto. The study included 58 treatment cases and 90 controls (no-treatment), in which over 90% of subjects were male. The SAFE-T Program was individualized to meet each adolescent’s needs. Routinely it included enhancing social relationships, enhancing prosocial sexual attitudes and knowledge, taking responsibility for the offense, relapse prevention plans, awareness of victim impact, and increasing positive family functioning. The treatment group had a 20-year sexual recidivism rate of 9% compared to 21% for the comparison group, and for any offense, 38% versus 57%. All comparisons were statistically significant and criminal charges were used as a measure of recidivism. These studies were encouraging regarding the effectiveness of a variety of treatment models with JSOs. Nevertheless, they are each limited. Of the studies cited, only the MST model was manualized, monitored program fidelity, and used a randomized design. However, none of the studies examined what psychological factors are associated with behavioral changes that result in reduced recidivism. MST, for example, doesn't address how the ecologically based family empowerment model will change the psychological characteristics of the youth, which in turn results in changed thinking and behaviors, which reduced recidivism. Although the Borduin et al. (2009) and Worling et al. (2010) studies posited the development of social skills and social reasoning as important components of treatment, neither provide a manualized model or theory regarding the development of these skills or provide research demonstrating positive outcomes in either area. Additionally, both studies were conducted with outpatient youth, and these models are not readily useable for youth in residential programs. The present paper describes a replication of the positive results of a 2009 study that used a randomized repeat time series design to examine short-term psychological outcomes. The original study and its subsequent replication, described in this paper, was based on an application of Aggression Replacement Training (ART), an evidence-based group treatment approach for increasing prosocial reasoning, social skills, and emotional control for probation youth (Goldstein, Glick, & Gibbs, 1998). ART was developed for the treatment of probation youth, and ART and related approaches result from a synthesis of research on adolescent development and treatment that was designed for probation youth. ART has three treatment modules, each of which is comprised of ten sessions: Social Skills, Anger Control, and Moral Reasoning. A recent survey of JSO practitioners in California found ART was the most widely used manualized "name brand" treatment method with 32% using it (California Coalition on Sexual Offending, 2012). Major influences to this model include Luria's (1961) neuropsychological theory of language and social development, Kohlberg's (1984) research on moral development, social learning theory articulated by Bandura (1973), and Meichenbaum's (1977) model of anger management training. Related models are the Prepare Curriculum: Teaching Prosocial Competencies (Goldstein, 1999) and Thinking for a Change developed by Bush, Glick, and Taymans (1997). The ART model has been validated in numerous outcome studies (Goldstein, Nensen, Daleflod, & Kalt, 2004). Amendola and Oliver (2010) reported that ART is a "Model Program" for the United States Office of Juvenile Justice and Delinquency Prevention and the United Kingdom Home Office. They also note it is classified as a "Promising Approach" by the United States Department of Education. Washington State found ART to be the most cost effective treatment for probation youth, reduced the 18-month felony recidivism by 24 percent, and the cost/benefit ratio, that is the dollars saved for every dollar spend for treatment, was $11.66 (Washington State Institute for Public Policy, 2004). ART as noted above is one of several prosocial interventions useful for delinquent youth. There are signs of a paradigm shift in adolescent treatment towards more prosocial, collaborative approaches that are also evidence-based. For instance, the Washington State Juvenile Rehabilitation Administration (Rongen, 2009) developed a similar approach for JSO youth on parole. In response to what they perceived as the limitations of relapse prevention interventions, their model used a strength based model rather than coercive or confrontational approaches. The original intervention study was based on ART and conducted in the summer of 2009. The study population for this intervention consisted of 17 males, all of whom were receiving residential treatment for sexual offenses, and had sustained charges in this regard. The average age of the group was 15.7 years, and 59 percent were in special education. The average score on the Juvenile Sexual Offense Recidivism Risk Assessment Tool-II (JSORRAT-II) was five which would fall into the moderate risk range with an average risk of juvenile recidivism of 24.3% (Epperson, Ralston, Fowers, DeWitt & Gore, 2006). The results of this study were published in greater detail elsewhere (Ralph, 2012). The outcome measure used was the Youth Outcomes Questionnaire (Burlingame, Wells, Cox, & Lambert, 2004). A randomized repeated time series design was used that assessed youth at three points before the intervention, once during the intervention, and twice post intervention. The experimental group had nine youth who received the ART intervention and the control group had eight which received a psychoeducational social relations program. The treatment group received all 30 sessions of the ART based intervention over a summer, and the control group received a psychoeducation program on teen adjustment, but this was not an evidence based curriculum. Additionally, staff were given training in ART and newer complementary research regarding prosocial development in adolescence described by Ralph (2012). Statistical analysis showed two scales, Critical Items and Somatic, showing improvement for the intervention group at below the .05 level. A third scale, showed marginal significance, Interpersonal Distress, at the .15 level. The intervention was conducted with high fidelity using Tennyson's criteria (Tennyson, 2009). The null hypothesis, that there was no effect for the ART intervention, could be rejected, and results were consistent with the alternative or experimental hypothesis that the ART based intervention may have improved social functioning. A confirmatory qualitative study using a focus group was conducted interviewing youth who had participated in the ART-based intervention and staff working with these youth. The qualitative results confirmed quantitative results. The present paper describes a replication of the previous study, but using a one group pre-post-test design without a control group. Like the original study, it examined psychological outcomes related to the intervention rather than long-term outcomes such as recidivism. Conducted in the summer of 2012, it investigated not only if there was positive therapeutic change associated with the intervention, but what type of psychological changes occurred and if these were consistent with current theory of why ART is effective. Pre-post changes, even in a randomized design, may not give clues to what type of changes occurred in behavior, thinking, and psychiatric symptoms. For a youth to not recidivate there has to be some change in his thinking and behavior. A youth must decide not to put himself in a risky situation or not engage in an antisocial act, and then continue making such choices. Our understanding of why an intervention is effective is not complete until we have a "theory" based on evidence of what actual changes occurred in the personality of the youth, their thinking, emotional regulation, and behavior, and what therapeutic mechanisms promoted it. Our ability to use a given intervention is strengthened if we not only know that it works but have a theory of why. The present study assessed not only changes in behavioral and psychological symptoms (e.g., noncompliance, oppositionality, depression, anger, anxiety, etc. ), but also whether there were changes in the level of prosocial reasoning youth exhibited similar to what Piaget and Kohlberg's research studied (Kohlberg, 1984). The original study and the present limited replication were also undertaken to demonstrate that an evidence and theory based, cost effective model of prosocial treatment could be readily implemented and show beneficial outcomes. Participants were 14 male adolescents all with sustained sexual offenses in a residential treatment setting for JSO youth, Teen Triumph, in Stockton, CA. Their average age was 15.5, 14% were in special education, and the average JSORRAT-II score was 5.0 which falls into the moderate level of juvenile recidivism. As described below, the JSORRAT-II is an empirically based risk assessment instrument for adolescents, currently in use in California. The intervention in the replication study was the same as that described above in the original intervention. It was delivered over a summer and based on ART, using all three modules: Social Skills, Anger Control, and Moral Reasoning. Each module had 10 sessions and the total intervention therefore had 30 sessions. As with the previous intervention, staff received a one day training in ART and newer complementary research. Ongoing supervision and monitoring of fidelity was done by the supervisors of the program. The complete ART intervention was done in a little over 10 weeks during a summer, and had 30 group sessions. The Child Behavior Checklist (CBCL), an instrument normed for use with youth 6-18, and completed by a parent or caregiver for the youth (Achenbach & Rescorla, 2001). The 113 item behavior problem portion was used. It assesses youth behavioral problems and uses a large normative and clinical database for rating youth. There has been extensive research done with this instrument. The instrument has eleven scales producing T-scores derived from a normative population, measuring different behavior problems including three summary scores. The scales are: Anxious/Depressed, Withdrawn/Depressed, Somatic Complaints, Social Problems, Thought Problems, Attention Problems, Rule-Breaking Behavior, Aggressive Behavior, Internalizing Problems, Externalizing Problems, and Total Problems. The Youth Outcome Questionnaire (Y-OQ) has seven scales measuring behavioral problems completed by a parent, teacher, or caregiver (Burlingame, Wells, Cox, & Lambert, 2004). The scales are Intrapersonal Distress, Somatic, Interpersonal Relations, Critical Items, Social Problems, Behavioral Dysfunction, and Total Score. The manual includes means and standard deviations for different samples, and statistics for a community (nonclinical) sample was used in this analysis. The Symptom Checklist 90-R (SCL 90-R): This instrument is completed by the youth and has adolescent norms (Derogatis & Savitz, 2000). The instrument has nine scales measuring different psychiatric symptoms and a total item summary scale. Each scale score is a T-score derived from a normative population. The scales were: Somatic, Obsessive Compulsive, Interpersonal Sensitivity, Depression, Anxiety, Hostility, Phobic, Paranoid, Psychotic, and a summary scale, the Global Severity Index. The Washington Sentence Completion Test (WSCT; Hy & Loevinger, 1996). The 18 item version instrument was used, in which youth are assigned to one of eight levels of interpersonal maturity. The levels are based on several developmental theories including those of Erikson (1993) and Sullivan and Grant (1957). The test has adequate interrater reliability and validity research. The levels of ego functioning identified are Impulsive, Self-Protective, Conformist, Self-aware, Conscientious, Individualistic, Autonomous, and Integrated. The modal stage for younger teens is the Self-Protective level and for older teens, the Conformist level (Westenberg & Gjerde, 1999). Prosocial Reasoning Outcomes (PRO): A new test of prosocial reasoning using story vignettes developed by the author. The test obtains the subjects' responses by interviewing them, and describes three levels of prosocial reasoning: Concrete, Normative, and Principled. Ratings were completed by two individuals. Lin's Concordance statistic was used to measure inter-rater reliability and was .76 (one sided, 95% CI .50 to 0.89; The National Institute of Water and Atmospheric Research, 2013). The SCL 90-R, the WSCT, and PRO were each completed by the youth. The CBCL and Y-OQ were completed by residential staff who were "blind" to the treatment condition. The WSCT and PRO are what are sometimes referred to as projective tests, in that they obtain samples of the youth's thinking and reasoning. The choice of assessment methods to be used was an important consideration in the research design. Current best practices for psychological assessment (Herson, 2004) includes the use of multiple informants. As Heron notes (2004), "employing multiple methods of assessment, as well as obtaining information from multiple informants, allows for a more complete and comprehensive perspective of the presenting area of concern" (p. 292). This approach was used in the present study. Responses from both the youth and a caregiver, and also multiple assessment methods were used, in this case including fixed response questionnaires, open-ended projective type tests, and qualitative information from a focus group with youth. It is assumed that if the factor being assessed is present (in this case the treatment effect from the intervention) then it should be reflected across different informants and different methods. Also, the assessment of the treatment effect has higher reliability if there is convergence among different methods and informants. PreT = Testing before, X = ART intervention, PostT = Testing after. This research design has limitations in ruling out rival hypotheses for assessing treatment effectiveness (Campbell & Stanley, 1963). Several rival hypotheses, for example, might explain the difference between pre- and post-test results. However, the previous study with the ART-based model, because of the randomized design, demonstrated that rival hypotheses could be ruled out for the sample used in that study. The present study was undertaken to examine not only whether prior results could be replicated, but also to yield more information regarding what types of specific psychological changes occurred. The experimental hypothesis for this study is that there will be an improvement from pre- to post-scores. A qualitative "focus group" was also used, as it was in the original study, to support or disconfirm hypotheses regarding quantitative results. A qualitative methodology described by Ralph (1980) as the "clinical method" was used to discern themes in the responses of youth, a model similar to the method described as "grounded theory" for qualitative analysis (Glaser & Strauss, 1967). One advantage of this approach is that novel hypotheses can emerge from the data. The use of qualitative methods was also part of the general strategy of using multiple methods of assessment, that is both quantitative and qualitative. It was assumed that if there was a treatment effect, it would be reflected in both quantitative measure changes as well as qualitatively in responses from youth about the impact of the intervention. The interviewer had a list of questions but, consistent with the approach used in clinical interviewing, these were used flexibly, and other questions that appeared relevant with the flow of conversation were also used. The author conducted the focus group interview but had no formal relationship to the residential program, did not participate in the research intervention, and was not previously known to the youth. Youth were promised anonymity regarding their individual responses. Total Test Profiles. This analysis looked at the net change over all tests administered. The "subject" or data point analyzed was each individual scale, not the youth. Each scale on all tests was assessed for the presence or absence of improvement in the score. Individual Scale Profiles. Differences on each specific scale, from pre-test to post-test, were assessed. In this analysis the "subject" or data point was each individual youth, and looked at the paired comparison, from pre-test to post-test. This "subject based" analysis is the approach used in most psychological and medical research. 1. Total Test Profiles: Analysis was completed for the five tests, involving 30 individual scales. Each scale was viewed as a data point, and differences between pre- and post-scores were analyzed using the Wilcoxon Test. Of the 30 individual scales, only three did not show improvement from pre-test to post-test. The z score was 3.96 and the p < .001, classified as a large effect size according to Cohen's typology (Becker, 2000). The results are shown in Figures 1, 2, 3, 4, and 5. For the CBCL, SCL-90R, and the Y-OQ, lower scores represent improvement, and for the WSCT and PRO higher scores represent improvement. The statistical analysis reflected the impression from visual inspection of Figures 1-5 that there was pre to post improvement. This finding supports the hypothesis that there was a global improvement across all the scales from pre-test to post-test, in which the ART intervention was the independent variable. 2. Individual Scale Profiles: Analysis of pre-post-changes for scales on each test was done separately from pre-post-changes for subjects. As noted, the analysis was based on changes in the subject scores, and not changes in test profiles reported in analyses 1 above. This analysis of changes in individual subject scores is the approach used most often in psychological and medical research. Results are shown in Table 1. * One sided p < .05. 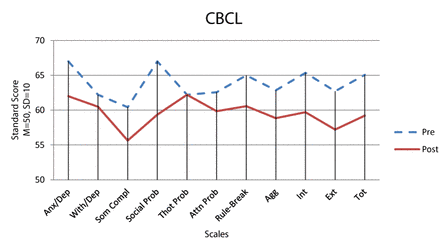 On the CBCL, five scales were statistically significant, indicating a reduction in acting out types of problems in the areas of social problems, attention problems, rule breaking, total externalizing score, and total score of items. This is consistent with the experimental hypothesis that these scores may have declined due to the intervention. On the CBCL, three scales were just over the .05 level of significance: Anxious Depressed, Aggressive Behavior (both at the .07 level), and Internalizing Total (at the .08 level). On the SCL 90-R, only the Anxiety scale declined. On the Y-OQ, Critical Items reflected severe psychiatric symptoms, and Behavioral Dysfunction, reflecting an improvement in organizing tasks, handling frustrations, and also inattention and impulsivity. These Y-OQ tests showed statistically significant improvement. 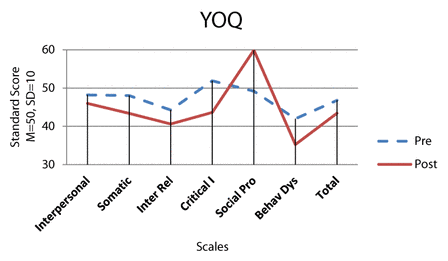 One scale on the Y-OQ, Interpersonal Relations, was at the .06 level of significance, just over the .05 level. 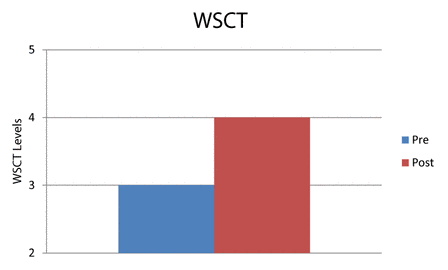 The WSCT and the PRO showed a significant increase in scores, shown in Table 1 and increased scores represent improvement. The changes indicated by the WSCT and the PRO scores reflect higher levels of emotional, moral, and interpersonal perceptions, and problem-solving. The WSCT measures interpersonal maturity by means of a projective type sentence completion test. The PRO uses the youth's responses to stories in a vignette format and provides an "ecologically valid" sample of actual prosocial thinking from the youth regarding everyday life situations teens might experience. For scales which showed a p-value of .05, the effect size was over 1.0, in which an effect size of .8 is considered large using Cohen's terminology (Becker, 2000). By way of comparison the effect size of antidepressants for published studies was reported as .37 (Turner, Matthews, Linardatos, Tell, & Rosenthal, 2008). The scores for the SCL 90-R and CBCL are developed from a large normative population in the form of a T-score (50 is the population norm with a standard deviation of 10). This enables the difference between pre- and post-test-scores to be expressed relative to differences in the distribution of the normative population. In figures 1 and 2, the results are plotted using population based T scores (M = 50, SD = 10). The pre-post-test changes are the greatest on the CBCL. Three of the statistically significant changes on the CBCL were greater than five points, which is half a standard deviation. These were Social Problems, Externalizing Total, and Total Items. This represents a clinically significant change. 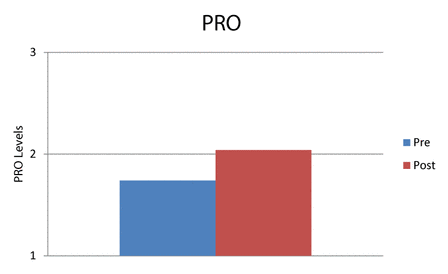 The WSCT and the PRO scales also showed significant differences between pre and post as shown in Table 1. These differences were not only statistically but also clinically significant, that is large enough to likely reflect changes in adaptive functioning. Information regarding the intervention was obtained using a focus group with 10 of the 14 youth who participated in the intervention. Youths were encouraged to give their opinions regarding whether ART helped or not, and what about it helped. The qualitative methodology used is described above in the methods section. Eight questions were asked of the group with follow-up to encourage elaboration. The eight questions and a summary analysis of responses are in Appendix 1. All the responses for Question 6 were provided because of the clinically relevant nature of the information. As can be seen, youth report ART was helpful in slowing down their reactivity, being able to think things through, and develop more adaptive, prosocial choices. This helped them get along better with others and feel better about themselves. This finding was consistent with the quantitative results shown above. Youth reported that the model "made sense", was easy to implement, and worked. The ART scenarios and role playing helped to make the information more easily used in real life situations. They could use prosocial reasoning and interpersonal skills to avoid conflicts. An unanticipated finding was that youth reported that they wished staff use the prosocial techniques themselves, and that they acted more mature. All youth found ART training valuable in some degree. The use of the qualitative method were also part of the multi-method, multi-informant methodology described about. It provided an opportunity for the confirmation of quantitative data by an entirely different approach, a qualitative method. It is also consistent with the goal of empowering youth and giving them a "voice." The present study supports the hypothesis that ART contributes to therapeutic changes on psychological outcomes for youth in residential JSO treatment, using multiple assessment methods with multiple informants. On the CBCL five scales showed statistically significant improvement from pre- to post-treatment. 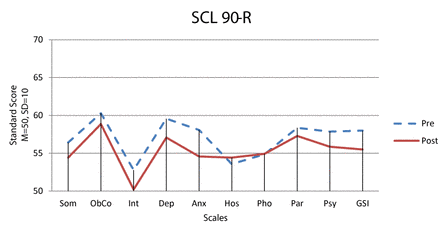 The Y-OQ results showed significant improvement on two scales and the SCL 90-R on one scale. The WSCT and PRO both showed clinically and statistically significant increases in scores. The finding of improvement on selective scales was complemented by global improvement on the overall profile of instruments. Results of a qualitative focus interview group with youth also indicated that youth self-reported improvement in functioning because of the ART intervention. The results of the present study, in combination with the original study, both looking at short-term psychological changes in youth, are noteworthy. However, as noted above, an extensive literature already exists supporting the effectiveness of ART with probation youth, in terms of generally reducing overall recidivism, a longer term outcome. This effect is important as nonsexual recidivism is about three times as high as sexual recidivism for JSO youth (Ralph & Wong, 2012). Indeed, a major hypothesized modifiable criminogenic risk factor for probation youth generally is prosocial reasoning skills, which ART helps remediate. Not only the present study, but the larger ART literature support this (Goldstein, Glick, & Gibbs, 1998). Also as Ralph and Wong (2012) point out, there is a high prevalence in JSO populations regarding psychiatric comorbid conditions that also require treatment in addition to sexual issues. The present study supports the hypothesis that ART may have an effect in reducing both internalizing and externalizing symptoms and improving psychiatric comorbid conditions. The study also helps identify a plausible mechanism of change consistent with current theories regarding ART. That is, the intervention increases the level of prosocial reasoning and skills or, in Sullivan and Grant's (1957) terms, interpersonal maturity, which may contribute to a decrease in both externalizing and internalizing symptoms. The WSCT, and particularly the PRO, with its social dilemma vignette format, take actual samples of prosocial thinking and reasoning from the youth, and the study was able to show pre-post-changes consistent with ART's theory. These changes in reasoning and thinking represent changes in neuropsychological functioning of the youth consistent with expected growth and development during this phase of life, and similar to those found on neuropsychological measures of frontal lobe functioning, an area of development in adolescence and young adulthood. From an evolutionary and adaptive point of view, it is an important area of not only adolescent, but also human, neuropsychological development. A substantial amount of brain activity for any individual is taken up with emotional regulation, negotiating social interactions, and figuring out cost/benefit calculations of personal needs versus social rules. While ART hypothesizes that increasing prosocial reasoning skills is a causal factor in therapeutic change, this had not been studied previously. Likewise, changes in externalizing and internalizing symptoms as a result of ART had not been previously studied. The current study adds to the ART literature in these ways. There was no extra cost to the treatment program for the ART intervention described in this paper. Although the training in ART was through donated services, the supervision, administrative time, and staff time were all accomplished within the usual program framework. If ART wasn't used during the summer, other group activities or programs would have had to have been provided. There was therefore not net cost to the program for the ART intervention. By contrast, the total first year costs for MST for two teams would be $933,000 with a cost per youth of $7,068 (The Center for the Study and Prevention of Violence, 2013). The provision of ART at no cost for the present intervention was a fortunate circumstance, but Washington State calculates the total cost per youth for ART is $897 (Washington State Institute for Public Policy, 2007). An important feature of ART is that it is cost effective, "user friendly", and easily implemented intervention suitable for both outpatient as well as residential youth. The present study has several limitations. The sample size of both the original study and the current study are small, and the replication of results did not use a randomized design. Also, while the developmental and symptoms outcomes studied were important, these are short-term psychological outcomes. Studying long-term behavioral effects of the intervention on sexual and nonsexual recidivism would be important in providing evidence for the effectiveness of ART. Reasons for the changes in pre-post-scores results for the sample could be due to other factors. The pre-post-test design of the present study cannot rule out alternative hypotheses by which to identify causes of observed changes, other than the ART type intervention. Usual rival hypotheses include maturation, a Hawthorne effect, testing effects, or history (events other than the ART intervention), for example. Nevertheless, ratings on the CBCL and Y-OQ were made by residential staff who were blind to the intervention, and changes in PRO and WSCT scores reflect increased sophistication in responses that represent developmental changes in thinking. It is difficult to see, for instance, how a Hawthorne effect would influence the scores on these instruments. In addition, three months (the time between pre- and post-scores) is too short for a statistically significant maturation effect to be evident on these instruments. No "common sense" rival hypothesis easily explains the changes observed. The qualitative research using a focus group design additionally supported the effectiveness of the ART intervention. The original randomized study and the current study were the first to research the use of ART interventions with a JSO population. However, ART has been shown in multiple studies to be associated with therapeutic outcomes, and within the general probation population with reductions in recidivism (Goldstein, Nensén, Daleflod, & Kalt, 2004). The present study provides a qualified replication of the results of the ART intervention with a JSO residential population. The null hypothesis of no effect of the intervention was rejected, and results were consistent with the alternative hypothesis that the ART intervention improved social functioning, reduced psychiatric, externalizing, and internalizing symptoms, and increased the level of prosocial reasoning. Multiple replications using the same design would have to be done to provide greater confidence in the results, however. When the author entered the field of JSO treatment over a decade ago, the dominant method used was the relapse prevention model which has major limitations, particularly with JSO youth. With ART and related prosocial models, we now have a viable evidence-based, affordable, practical, and user friendly treatment method available for JSO youth. There is good evidence that ART reduces general recidivism, and qualified evidence from the present study, as well as the previous study, indicating ART may contribute to reduction in levels of psychiatric symptomatology, increases levels of prosocial reasoning and thinking, and can be used with a population of juveniles who have committed sexual offenses. Achenbach, T. M., & Rescorla, L. A. (2001). Manual for the ASEBA school-age forms and profiles. Burlington, VT: University of Vermont, Research Center for Children, Youth, and Families.Amendola, M., & Oliver, R. (2010). Aggression replacement training stands the test of time. Reclaiming Children and Youth, 19, 47-50. Borduin, C., Schaeffer, C., & Heiblum, N. (2009). A randomized clinical trial of Multisystemic Therapy with juvenile sexual offenders: Effects on youth social ecology and criminal activity. Journal of Consulting and Clinical Psychology, 77, 26-37. Bush, J., Glick, B., & Taymans, J. (1997). Thinking for a change: Integrated cognitive behavior change program. Longmont, CO: National Institute of Corrections. Derogatis, L. R., & Savitz, K. L. (2000). The SCL-90-R and the Brief Symptom Inventory (BSI) in primary care. In M. E. Maruish (Ed. ), Handbook of psychological assessment in primary care settings (pp. 297-334). Mahwah, NJ: Lawrence Erlbaum Associates,. Epperson, D., Ralston, C., Fowers, D., DeWitt, J., & Gore, K. (2006). Actuarial risk assessment with juveniles who sexually offend: Development of the Juvenile Sexual Offense Recidivism Risk Assessment Tool-II (JSORRAT-II). In D. Prescott (Ed. ), Risk assessment of youth who have sexually abused (pp. 118 169). Oklahoma City, OK: Wood N’ Barnes. Erikson, E. (1993). Childhood and Society. New York: Norton. Goldstein, A., Nensén, R., Daleflod, B., & Kalt, M. (2004). New perspectives on aggression replacement training: Practice, research, and application. West Sussex: Wiley. Hersen, M. (2004). Comprehensive handbook of psychological assessment. Hoboken, NJ: Wiley. Hintze, J. (2013). Number Cruncher Statistical Systems (NCSS) 2009. Kaysville, UT: NCSS. Hy, L. X., & Loevinger, J. (1996). Measuring ego development. Hillsdale, NJ: Lawrence Erlbaum Associates, Inc.
Knoff, F., Freeman-Longo, R., & Lane, S. (1997). Program development. In G. Ryan & S. Lane, (Eds. ), Juvenile sexual offending: Causes, consequences, and correction (pp. 183-200). San Francisco, CA: Jossey-Bass Inc.
Kohlberg, L. (1984). Essays on moral development: The psychology of moral development. San Francisco, CA: Harper & Row. Luria, A. (1961). The role of speech in the regulation of normal and abnormal behavior. New York, NY: Liveright. Meichenbaum, D. H. (1977). Cognitive-behavior modification: An integrative approach. New York: Plenum. Ralph, N. (1980). Learning psychotherapy: A developmental perspective. Psychiatry, 43, 243-250. Ralph, N. & Wong, K. (2013). A prosocial collaborative model for juveniles who sexually offend. ATSA Forum, XXV(1). Reitzel, L., & Carbonell, J. (2006). The effectiveness of sexual offender treatment for juveniles as measured by recidivism: A meta-analysis. Sexual Abuse: A Journal of Research and Treatment, 18, 401-421. Rongen, K. (2009). Integrated treatment for youth who have sexually offended. Washington State Juvenile Rehabilitation Administration. Turner, E. Matthews, A., Linardatos, E., Tell, R., & Rosenthal, R. (2008). Selective publication of antidepressant trials and its influence on apparent efficacy. New England Journal of Medicine. 358, 252-260. Question 1: What was it like going through the ART training program? General impression on how it flowed, set up, etc.? Sample answers: ART was helpful, actually acting out scenarios helped to make them more real and allowed implementation in real life circumstances to come more easily to youth. Question 2: What do you remember from skills training (role playing)? Sample answers: Youth reflected on increased ability to "think before acting," youth spoke to an increase in ability to talk through issues before acting out in aggressive ways, youth developed an increase in ability to recognize negative feelings as not permanent and ability to let things go. Question 3: So when you're feeling anger what did you learn to do with it? Sample answers: Ability to use coping skills and reasoning to avoid additional conflict. Question 4: Do people remember the moral reasoning part? Sample answers: Increased ability to recognize thinking errors and replace aggressive behavior with positive response, increased ability to recognize potential consequences to actions. Question 5: What are other examples about what people got from ART program? Sample answer: Better decision making and impulse control. Question 6: Anything in last couple weeks used from ART that is helpful for you? The most recent one was the fact that I got a phone call from my mom. She's struggling with drugs. It's hard for me ‘cause I want to be there to help her but I can't because I'm in this program. I was angry but chose to isolate myself because I knew I would take my anger out on others if I was around them. I identified a better solution because I knew what the consequences would be if I took it out on my peers. Yeh, this guy came to me and gave me the middle finger. I decided not to talk back to him or cussing him out I decided to walk away. A teacher pulled out my paper and crumpled it up in my face and I felt like punching him and walking away. I remembered thought process training so instead of talking to him because it would have got out of hand I decided to write him a letter. I made a choice to not get myself in trouble when an adult was mad. Then he apologized the next day and things were ok. There are annoying kids around. It agitates me but I decided to use deep breathing and let it go by instead of getting upset. I would say that there was one lesson where showing affection and talking to people you have problems with - I wasn't talking to my dad because I was having problems with him. Finally after talking to my social worker I called him on the phone and started talking to him and we have an ok relationship. ART gave me a couple different ways to use to talk to him. Calmed me down before I talked to him and gave me a few steps. This dude stole my ice cream. He ate it and I had to go buy another one. Normally I would have blown up on everyone to find out who stole my ice cream but I decided to be cool and just buy another one. I was sleeping in class but I had permission to. Staff woke me up to go on break. People were being hella loud and staff ratted on me. Usually I would have ended up arguing with staff instead I just ignored it. Over this weekend I got in trouble for profanity. ART helped me react different to my consequence. Normally I would have just been angry and cussed the staff. ART gave me other options to cope with the anger. So I did other things like work out. There was this guy who was being really mean to me. I wanted to go to the teacher and say, he's bullying me and I'm going to put a hit on him. I asked the teacher for help instead. ART gave me another resolution. Trying to slow things down. There is a resident that kept messing with the table while I was trying to do my work. I kept asking him to stop but he wouldn't stop. He started yelling and I started to raise my voice but I thought to myself and said it's not really worth it because there are other things to worry about. Instead of arguing more I took a time out and relaxed. Rather than just react I was thinking it through. Question 7: Does your one-on-one counseling incorporate ART? Sample answer: ART is not often incorporated into one-on-one sessions for youth. Perhaps training more clinicians to incorporate ART material would be useful. Question 8: Any ideas to make things better around ART? Sample answers: All found ART training valuable in some degree, youth would like to be rewarded for making use of the material, incorporating other teaching aids besides the book and groups (e.g. posters, presentations) would be useful.